Captain Dominic Holland (Dom) is head of a covert operations team which investigates bioterrorism. As he and his team check out some suspicious activity on what was believed to be an abandoned oil rig, bone-armored mutant men begin to wash up on shores of countries around the world. Soon, citizens become crazed – brutally attacking and devouring people. Dom’s team rushes to find a cure to the bioweapon, as civilization crashes around them. I think this book will be quite enjoyable to anyone who likes biotech apocalypse thrillers, especially those who enjoyed Jonathan Maberry’s Patient Zero. But beware, it is the first in a series, and the story just cuts off at the end – there’s not a satisfying conclusion. 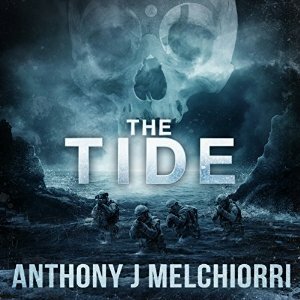 Luckily, Melchiorri is releasing the second one hot on the heels of the first, so this may not be an issue for many readers. I decided to give this book four stars despite the fact that there wasn’t a satisfying ending. The science was excellent and it was just what a biotech thriller should be. Bad science also gets in the way of me enjoying certain stories. I always appreciate it when an author takes the time to make science and technology plausible. Yeah, it's a pretty important part of writing science fiction.